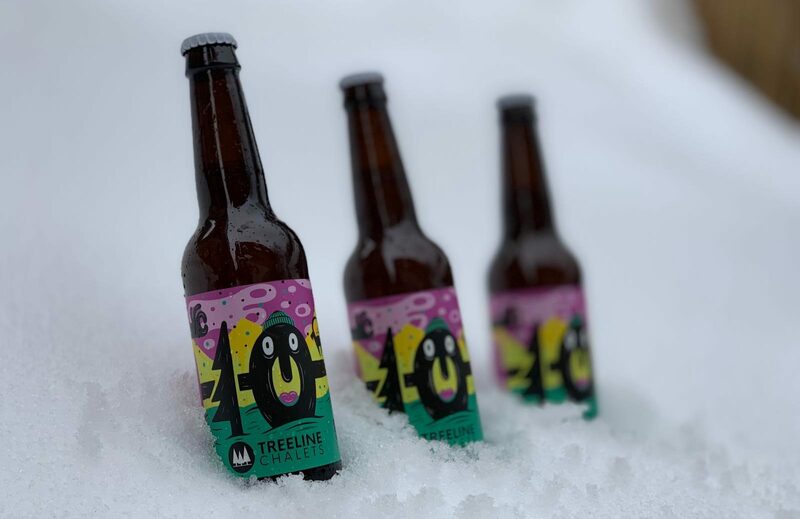 Treeline’s 10 year Anniversary Beer! We are excited once again to collaborate with the local Morzine brewery, Ibex Microbrasserie, to create our very own beer. This time to celebrate our 10th winter in Morzine, and T10 is exclusively available to our guests in our catered chalets (and friends) this winter! T10 is a New England style IPA (NEIPA) which has been brewed on the more ‘session’ end of the scale. It has a round and full bodied mouth feel (thickness when drinking) from the high level of wheat and oats used during brewing. These also help to make the beer cloudy, alongside when the dry hops are added during the fermentation. Bitterness is low – 12 IBU – in keeping with the style. On the hop side, Ibex wanted to have a good hop character but not for it to be over powering, as this style of beer may be new to the wide client base that we have at Treeline Chalets. El Dorado is the main player in the hops, alongside a bit of Citra, Mosaic and Simcoe. We get a bit of melon, honey, stone fruit, citrus and light tropical fruit when we drink it, but everyone has a different pallet, so make your own mind up and see what you can taste! The beer is brewed less than a mile from all the chalets in small batches with the label being designed by our friend & talented artist Katie Guthrie.